This post is brought to you entirely thanks to a friend of mine. It would be completely impossible otherwise, since Google Translate is really terrible at Arabic. I don’t speak Arabic, or know much about Saudi Arabia, but my Expert Consultant does! I found these websites through Google Image Search for تطريز البشت (my friend’s suggestion), which means embroidered bisht, and my friend then translated for me. 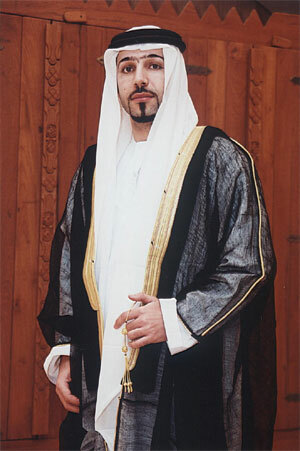 The bisht (بشت) is a traditional cloak worn by Saudi Arabian men on special occasions. 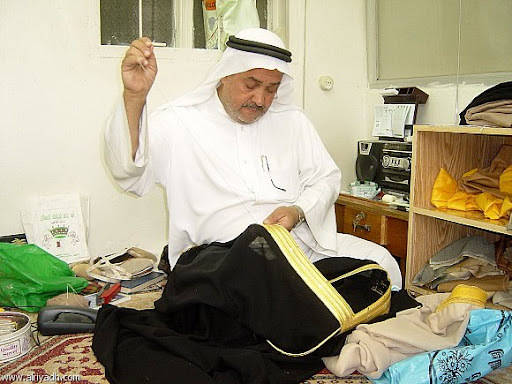 Bisht is derived from the Persian word for “back” since it goes on your back. It’s generally made of wool, and is usually black, brown, beige, cream or grey. The focus is meant to be on the fancy embroidered edging. Since it’s men’s clothing, it’s traditionally created by men. 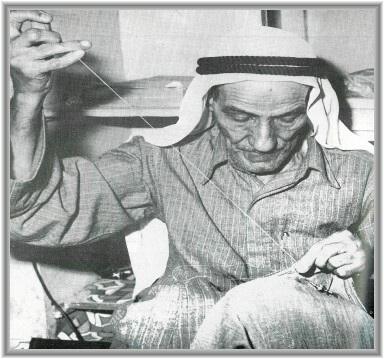 These two photos of the process of embroidering a bisht are from an article about someone who worked on research about the bisht. The researcher discovered that working in groups like the photo below resulted in higher quality embroidery. 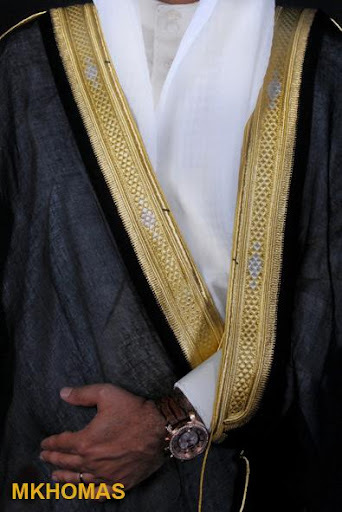 There are three main types of embroidery for a bisht: gold zari, silver zari, and silk. The gold and silver threads are called Zari, derived from a Persian word (source website). The silk type is less common. 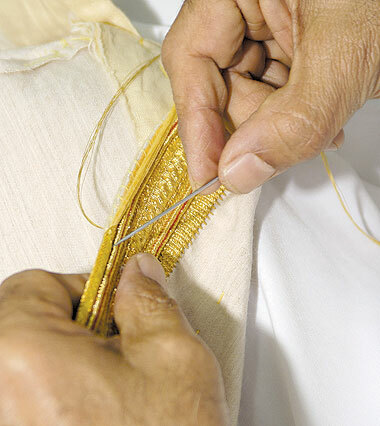 Embroidering a bisht by hand is a fading tradition. Most are created by machine embroidery now, but people are trying to preserve the art. This entry was posted in Embroidery around the world and tagged bisht, embroidery, saudi arabia, zari. Bookmark the permalink. I love seeing the connections around the world through embroidery styles. That’s a lovely braid-pattern on the finished border! I like the chairs they’re using in the group photo, too – both the built-in bin for supplies and the fact that a footstool is unnecessary for supporting the cloth! Low chairs are actually very common in Saudi Arabia. I don’t know if the bin is really built in, or just placed between chairs. But they do look very convenient! I emailed you – hope you got it! If not, check your spam folder. Please can u send me some pictures of bishts in dubai?